The fact that private equity-backed companies provide a substantial impetus to the economic performance and global competitiveness of the UK is now well established. This new report, undertaken by Arbor Square Associates on behalf of the BVCA, demonstrates the impact of the UK private equity industry as one of the UK’s leading financial services. The research was commissioned in order to examine two key features of the UK private equity industry. Firstly, the significance of private equity firms as a source of fee revenue for UK professional, financial and business services firms, through the industry’s fundraising, investment and divestment activities. Secondly, the size of the pool of professionals currently engaged in private equity-related activities, both within private equity firms themselves and within the professional and financial services firms that advise and provide services to the private equity community. We believe the findings of this report reinforce the importance of the UK private equity industry, not only as a vital part of the economy by helping businesses to grow and succeed, but also as a major component of the City of London and UK’s financial service sector. The UK financial and professional services industries are major contributors to the UK economy, accounting for 8.6% and 3.6% of GDP respectively. They accounted for £344.5 billion of UK GVA (gross value added) in 20041, far outweighing any other sector. The UK, and London in particular, is arguably the world’s pre-eminent financial centre, providing a global hub for international institutions, firms and investors. The strength of the UK’s global financial services industry has been a key driver in the development of the UK private equity industry into a leading international market, second only to the US in size. The industry has benefited strongly from its access to a pool of highly-skilled personnel and a well-established community of advisors and supporting organisations. It has grown steadily over the past two decades with the equity invested in UK businesses growing by 22% per annum since the early 1980s to reach almost £12 billion in 2005. Over the past six years, private equity funds have raised nearly £70 billion of capital for investment into unquoted businesses, £27 billion of this in 2005 alone. On the back of this long-term growth, the private equity industry itself is playing an increasingly significant role as a revenue generator within the financial services industry, contributing to the overall impetus that these industries provide to the UK economy. In total, there are over 10,000 highly skilled professionals across over 1,000 firms engaged either directly or indirectly in private equity-related activities. There are currently more than 260 private equity, venture capital, fund of funds and secondaries investment firms in the UK. They employ more than 5,500 people, 3,500 of which are experienced investment professionals. In addition to this, the UK has an estimated network of 750 financial, professional and business services firms providing advisory and financial support to private equity houses. They employ a full-time equivalent pool of close to 6,700 executives involved in private equity-related advisory and support services. The ‘multiplier effect’, of the UK private equity industry is considerable. For every private equity executive investing directly in UK companies, there are 2.3 full-time equivalent advisors or finance executives providing specialist advice and services. Furthermore, each of the supporting industries providing services to the private equity industry has its own support network of professional and business services firms. 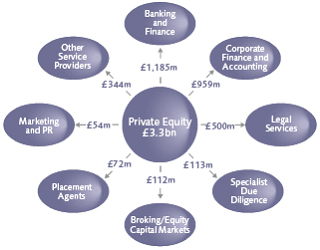 For firms operating within the UK financial, professional and business services sectors, the private equity industry has become a significant source of income, generating estimated fee revenue of over £3.3 billion in 2005. This equates to more than 7% of the total annual turnover of the UK financial services industry and average annual fees of nearly £500,000 per executive working on private equity-related mandates. 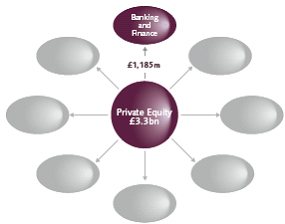 Private equity transaction fee revenue of around £2.6 billion went to banking groups, corporate finance and accounting firms and law firms. Other professional services firms, due diligence providers and other key advisors providing core transaction services (ie stockbrokers and equity capital market teams) generated an estimated £351 million. A further £343 million of fee revenue was generated for the support services sector as a result of fundraising activities and the general operating costs of private equity firms. More than 80 UK-based banking and finance groups provide debt facilities to private equity-backed companies. These groups, which include investment and commercial banks and specialist mezzanine investors, have a full-time equivalent pool of more than 1,200 professionals working on private equity-related mandates. They generated nearly £1.2 billion in debt arrangement fee revenue from transactions involving UK private equity houses in 2005. Private equity-backed transactions account for an increasingly significant proportion of total M&A (mergers and acquisitions) activity in the UK. For the last three years, private equity houses have accounted for an average of 20% per annum of the total UK M&A market value, almost double the average proportion of the previous three years. This is reflected in the levels of fee revenue generated by investment banking firms from these deals. Almost 30% of all UK investment banking revenue from M&A advisory work and loan financing was derived from private equity transactions in 2005 (Dealogic 2005). UK-based investment banks accounted for almost 15% of global investment banking revenue from private equity-related transactions in 2005. This puts the UK second only to the US in terms of its share of global sponsor-related investment banking fees (Dealogic 2005). 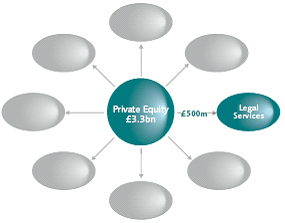 There are around 200 law firms in the UK providing legal services to private equity firms. They range from large international firms with dedicated specialist private equity practices to small regional firms undertaking private equity-related mandates on an ad hoc basis. These firms generated an estimated £500 million of revenue from private equity-related services in 2005. Collectively, UK-based law firms operating within the private equity market employ a full-time equivalent workforce of more than 1,500 professionals. Almost half of these lawyers are employed by the top 34 most active UK-based firms in private equity, which comprise a mixture of international, national and regional groups. The UK, and particularly London, is a major international centre for legal firms and has a world-class population of international firms providing services to an increasingly international private equity community. Alongside the UK’s international legal community exists a diverse network of national and regional practices for which private equity represents a significant revenue stream. 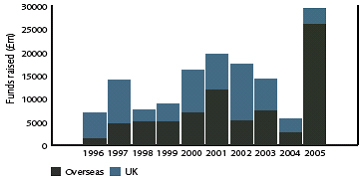 The UK’s small buyout market, mid-market and venture capital market generate, on average, 1,200 deals per annum. Many of these are based outside London and therefore represent a significant source of deal flow for those law firms servicing regional private equity communities. 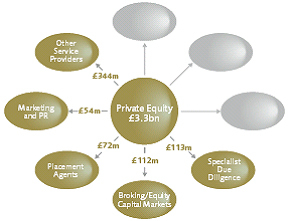 UK private equity firms backed over 1,500 companies in 2005, committing over £11.7 billion of equity. Additionally, 350 private equity-backed companies were divested via sales to corporates, other private equity houses or financial institutions. These are transactions where the services of an intermediary are likely to have been commissioned. The UK private equity industry therefore generates a rich supply of advisory mandates for the UK accounting and corporate finance community. A diverse community of advisors, an estimated 190 UK-based firms, provides corporate finance and transaction services advice to the UK private equity community. There are four key advisory groups consisting of the Big Four accountants, mid-tier accountancy practices, investment banks and smaller corporate finance specialists. Firms providing corporate finance and financial due diligence services for private equity transactions were the second most significant fee-earning category, next to debt providers, operating within the private equity industry. Their services generated almost £1 billion of fee revenue during 2005, representing around 6% of total accountancy fee revenue for the year. An estimated 2,300 full-time equivalent corporate finance, accounting and transaction services professionals were engaged in private equity-related work in 2005. The average fee generated per head by these professionals over the course of 2005 was more than £400,000. Together, this network of firms supporting the UK private equity community generated almost £700 million of fee revenue from UK-based private equity groups in 2005. They have almost 2,600 full-time equivalent professionals engaged in the following private equity-related activities. Specialist due diligence More than 70 of these firms in the UK provide private equity investors with in-depth operational, technical, environmental, management, strategic and commercial insights into potential investment opportunities. Stockbrokers For the 30 or so firms providing equity capital markets services to private equity firms, 2005 was a busy year. A total of 42 private equity-backed IPOs were completed in 2005, worth almost £5 billion in total. In addition to new listings and sales of quoted equity, brokers also provide key services in relation to fundraising programmes of quoted investment vehicles operating within the UK private equity market. Placement agents There are close to 30 placement agents active in the UK market. They are used either to manage an entire fundraising programme, or to raise capital from new investors after an initial closing of a fund. The majority of these agents are independent boutiques, although a number of investment banks offer a placement service and there is also a community of ‘one-man-band’ agents. Marketing, PR, data and research Differentiation and market positioning are of increasing importance to private equity firms in a mature and competitive UK industry. A broad base of groups and specialists support private equity firms in the areas of marketing and public affairs. Furthermore, the increasing sophistication of the marketing and communications strategies of private equity firms has created strong demand for data and research. Executive search agencies Demand for private equity search services within the UK private equity industry has increased as the industry has matured. These agencies are engaged in recruiting investee company management team members, or executives for the private equity firms themselves. Other professional services Private equity firms also require property/real estate agents and advisors, fund administrators, information technology services, professional training, pensions and actuarial advice, risk advisory, tax and audit services, among others. The report was undertaken on behalf of the BVCA by Arbor Square Associates, an independent specialist consultancy firm operating within the alternative assets sector. The report examines two key features of the private equity industry’s significance within the broader financial and professional services sector – as a source of fee revenue and as an employer of professionals currently engaged in private equity-related activities. The research phase took place between July and October 2006 and combined primary and desk sources to produce a set of accurate estimates for the amount and types of fee expenditure by the private equity industry and levels of employment within the industry and affiliated service providers. A total of 193 private equity houses, funds of funds, secondaries investors and professional and financial services firms contributed to the primary research phase, providing details of their 2005 fee expenditure and team sizes. The main data sources drawn upon during the desk research phase were: BVCA (investment activity data, reports and directory of members), CorpFin, Centre for Management Buy-out Research (CMBOR), Dealogic, International Financial Services London (IFSL), InvestorAccess, London Stock Exchange Statistics, Office for National Statistics, Standard & Poor’s Leveraged Commentary and Data, and VentureSource. Full sourcing details can be found in the full report, available from the BVCA. The BVCA, founded in 1983, is the industry body for the UK private equity and venture capital industry. Its membership of around 390 firms represents the overwhelming number of UK-based private equity and venture capital providers and their advisers. The BVCA has over 23 years of experience representing the industry, which currently accounts for 51% of the whole of the European market, to government, the European Commission and Parliament, the media, regulatory and other statutory bodies at home, across Europe and around the world. BVCA promotes the industry to entrepreneurs and investors, as well as providing services and best practice standards to its members. Founded in 2006, Arbor Square provides strategic consulting services to groups operating within the alternative assets industry. An independent and objective source of market analysis and intelligence, their work combines academic research processes with a real-world understanding of industry dynamics. The partners are information specialists, with an unrivalled knowledge of data and relevant contextual research. They have more than 33 years’ cumulative experience of private equity and have worked together as a team in various guises for over seven years. 1 Latest data available at time of writing.